Learn from online? Are you Crazy? Someone left this comment on a Bagua video we posted over on Facebook this weekend. The myth that video training is useless is fading fast due to the rise of youtube and other video training options. …But apparently it still persists amongst some folks. Which seems odd, considering how highly regarded the Tai Chi Classics are. Yang Cheng-fu, Wang Tsung-yueh, Wu Yu-hsiang, T’an Meng-hsien and many other highly skilled and revered Tai Chi masters thought it was worthwhile to create written materials on Tai Chi. Granted, the classics aren’t the easiest of documents to decipher. …but imagine what those folks would have done if they’d had an iPhone and Youtube? We’ll they didn’t, but we do. 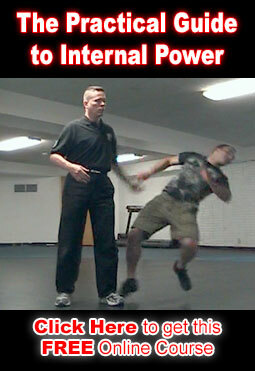 This teaches the fundamentals of Bagua so that anyone anywhere can begin benefiting from this art. …and the more internal arts practitioners there are, the easier it becomes to find training partners. The availability of training partners is one of the most important things any art needs to grow but in the case of Bagua it’s absolutely vital. Bagua at it’s core is a multiple opponent system and without groups of people out there training multiple opponent drills the art simply cannot survive. There are still a few spots open to get some hands on training with Sigung Clear.